Macular degeneration affects the macula, the small, sensitive area of the retina which provides our central vision. The macula allows us to see fine details and gives the “pinpoint” vision we use for tasks such as reading small print, recognizing faces, shapes, and colors, threading a needle, seeing a computer screen, and driving a car. 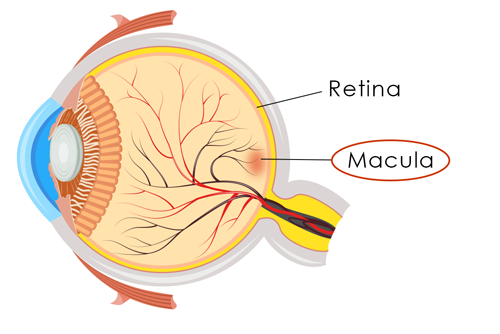 macula: The area in the center of the retina that provides our detailed, central vision. retina: The light sensitive tissue lining the back of the eye. The retina sends the images we see to the brain. Age-related macular degeneration is the deterioration of the macula. A common symptom is a blurred area in the center of your vision. 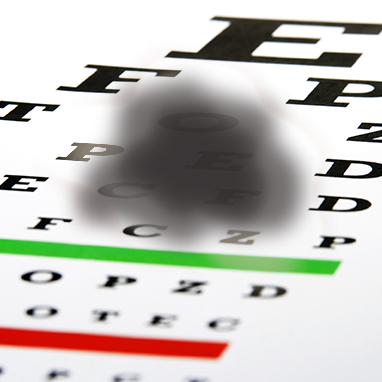 As AMD progresses, the blurred area grows larger causing blank spots in your vision or faded colors and distortion may be noticed. There are two types of AMD: the most common form is “dry” or atrophic AMD encompassing 85-90% of AMD patients.1 When atrophic advances to the less common but more serious form, exudative or “wet” AMD, abnormal blood vessels form underneath the retina causing rapid and significant vision loss. Leading a healthy lifestyle may help reduce the risk of macular degeneration or slow its progression. Not smoking, eating a nutritional diet rich in green leafy vegetables and omega-3 fatty acids, maintaining healthy blood pressure and cholesterol levels, and exercising regularly are not only beneficial to your overall wellness but your eye health as well. 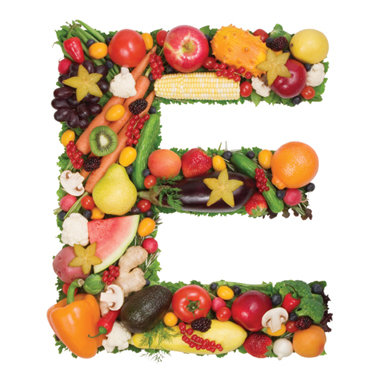 The Age Related Eye Disease Study (AREDS) illustrated the use of vitamins with high levels of antioxidants and zinc can help reduce the progression of AMD. Please note, patients should not begin a vitamin regiment without guidance from their doctor. Regular eye exams are key to detecting any eye disease. Since there is currently not a cure for macular degeneration, it is integral that it be detected as soon as possible to prevent vision loss. Early: The presence of medium-sized drusen can be detected through a dilated exam at your regular eye doctor but there are typically no visual disturbances at this stage. Intermediate: Symptoms such as larger drusen and retinal pigment changes may be detected through an OCT (optical coherence tomography) . 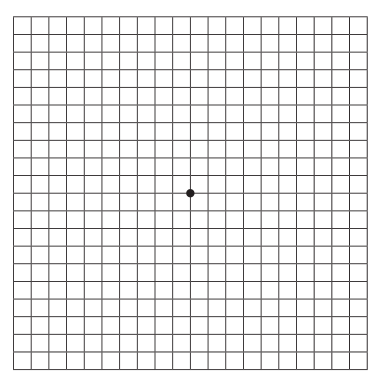 Vision loss may not be significant but may show more “waviness” on the Amsler Grid (see below). Late: The advanced stage of macular degeneration leads to wet or exudative AMD causing noticeable vision loss. Treatments help slow the progression and preserve the remaining vision. AMD progresses at different rates in different people. While there is no way to regain vision already lost, early detection is key, treatments are available to slow the progression, and low vision services can help make use of remaining vision. The best way to prevent damage from the effects and progression of dry to wet macular degeneration is through regular dilated eye exams by your ophthalmologist. Dry AMD, the most common form, occurs with the natural aging of the eye. Tiny, yellow, fatty, protein deposits called drusen form under the macula causing deterioration. The drying and thinning of the macula result in a gradual decrease in central vision. Regular eye exams are key in diagnosing AMD and many other eye conditions. Drusen on the retina can be detected in a comprehensive eye exam before you experience symptoms in your vision. The American Academy of Ophthalmology recommends adults with no signs or risk factors for eye disease get a baseline screening at age 40 — the time when early signs of disease and changes in vision may start to occur. Based on the results of the initial screening, your regular eye doctor may refer you to a specialist to treat for a specific condition. If vision has already been affected by AMD, you may notice blurred vision, straight lines appear wavy, colors may seem faded, more light is needed for tasks, or the size of objects do not seem accurate. You may also notice a dark or blank area in your central field of vision. If your eye doctor suspects macular degeneration, he or she may refer you to a retinal specialist for a comprehensive, dilated exam. Drs. David Westrich and Tatyana Metelitsina are fellowship-trained vitreo-retinal specialists and treat all conditions of the retina at Eye Care Specialists. At this exam, Dr. Westrich or Dr. Metelitsina will dilate (enlarge) the pupils using eyedrops to examine the eyes with an ophthalmoscope, a device that allows the doctors to see the retina and other areas at the back of the eye. If AMD is detected, additional testing may be indicated such as an OCT (optical coherence topography) or a fluorescein angiogram. After your exam, your doctor may recommend using an Amsler grid to detect vision changes such as wavy, blurry, blank, or dark areas in your eye sight. Click here to print an Amsler grid test to use at home. Currently, there isn’t a cure for age-related macular degeneration. However, past studies have shown nutritional supplements slow the progression of the disease but do not regain vision already lost. In 2001, the National Eye Institute published the results of its Age Related Eye Disease Study (AREDS). The study concluded that a combination of vitamin C, vitamin E, beta-carotene, zinc, and copper can reduce the risk of late-stage AMD by 25 percent2. The AREDS2 study explored whether the AREDS formula could be improved. This study concluded by replacing beta-carotene with a mixture of lutein and zeaxanthin, risk of late AMD may be further reduced3. Never start a nutritional supplement regimen without your doctor’s guidance. After a complete examination with Dr. David Westrich or Dr. Tatyana Metelitsina, you can develop a plan to minimize the affects of AMD. Wet AMD, also known as neovascular AMD, occurs when abnormal blood vessels grow underneath the retina. When these blood vessels leak fluid or blood, it causes damage to the macula affecting central vision. Usually blank or dark spots begin showing in the center vision affecting daily activities. VEGF is the vascular endothelial growth factor chemical in the body. Although VEGF is needed in our bodies for the growth of new blood vessels, in the macula of the eye it can be unhealthy. VEGF causes the growth of new, abnormal blood vessels behind the retina which then leak blood and fluid into the retinal layers causing vision loss. Anti-VEGF Treatment is currently the most common and effective treatment for wet macular degeneration. With this treatment, an anti-VEGF drug, such as Lucentis, Eylea, or Avastin, is injected into the eye with a very fine needle. The drug inhibits the development or leaking of the abnormal blood vessels slowing vision loss. Although an injection in the eye sounds scary, a topical anesthetic is used so it is usually not painful. These ongoing treatments slow the progression of macular degeneration and preserve your vision. Photodynamic Therapy (PDT) is a two-step, in-office procedure. First, Visudyne, a photo-sensitive drug, is injected into the blood stream through a vein in your arm. Visudyne attaches to molecules found in abnormal blood vessels allowing a special low-power, cool laser to target them in the macula. The drug activates when the laser fires and seals only the unwanted blood vessels without causing damage to the healthy ones. Typically multiple treatments are required as the abnormal blood vessels may reopen. Thermal laser therapy cauterizes the abnormal blood vessels with a high-energy, focused beam of light which terminates the growth and prevents further leakage. This treatment is often used if the blood vessel growth is in a condensed area away from the center of the macula. Laser therapy helps prevent severe vision loss but leaves a permanent blind spot at the laser treatment point. Drs. Westrich and Metelitsina perform the procedure in the office. Sometimes retreatment may be needed within three to five years. 1 “What is Macular Degeneration.” American Macular Degeneration Foundation (AMDF), Web. 2 “Age-Related Eye Disease Study–Results.” National Eye Institute, Web. May 2013. 3 “Age-Related Eye Disease Study 2 (AREDS2).” National Eye Institute, Web. May 2013. Other resources include: AAO, AMDF, National Eye Institute.